On its seventh year, the Philippine International Pyro-Musical Competition is back and ready to light up the sky with displays that will both have your eyes popping and your heart pounding. Featuring performances from competing countries such as the USA, the United Kingdom, Portugal, Italy, the Netherlands, Germany, Canada, Australia, China, and France, one thing's for sure—it's gonna be a fireworks spectacle like you've never seen. Of course, host country the Philippines, though not part of the competition, has the very special role of lighting up both opening and closing ceremonies. And, certainly, the musical acts are gonna be off the hook. Catch Jinky Vidal on opening night, February 13; the heartfelt songs of Hale and the powerful vocals of Morissette accompanying the showcase of the UK and Italy on February 20; watch Brownman Revival and Sarah Lahbati alongside the expo's of the USA and the Netherlands on February 27; M.Y.M.P. on March 5 with Canada and Germany; Side A with Australia and China on March 12; and catch France's demo on March 19, along with a blazing Filipino closing ceremony, and performances by the UST symphony orcherstra, and the one and only pop princess, Sarah Geronimo. Lots too look forward to at the 7th PIPC, but if you need any more convincing, here are more reasons you should really score your tickets, ASAP. Every Saturday starting February 13 til March 19, countries will compete for fireworks supremacy, with each country in it to win it. There are 10 countries in the competition, so watch how they light up the sky, precisely choreographed to awesome music. Better have a ton of space in your phone to document this spectacle. Nervous about that first date, or looking for something new to try out? Head on over and let the fireworks speak for you. Definitely no awkward silences here—it will be so loud and you’ll be too busy being wowed to talk, anyway. Shell out more to get to patron tickets for a better view and a buffet. Sure worked for Jasmine when Aladdin got some fireworks popping. Best background for that selfie is when the sky is exploding with all colors imaginable. That shot’s going to get double your usual number of likes—just make sure you’ve got your selfie stick ready and wait til the finale to get the best shots. Additional likes if you get this close to the fireworks. Take malling during the weekend to the next level! After a day of strolling around SM Mall of Asia, bring the kids to see the show to cap off what they’ll remember as their best day ever. It gets a bit smoky and very crowded, so take extra precautions when you’re with small children. You’ll be up for the best parent award this year. Because you really will when you see your IG, FB and Twitter feeds filled with photos of fireworks. Buy tickets now or you’ll run the risk of not getting good seats, or *gasp* having the show you wanted sold out already. Think once you’ve seen one fireworks display, you’ve seem ‘em all? Those NYE celebrations got nothing on this competition It will take a couple of minutes for you to collect your jaw from the floor again once the pyromusical is finished. 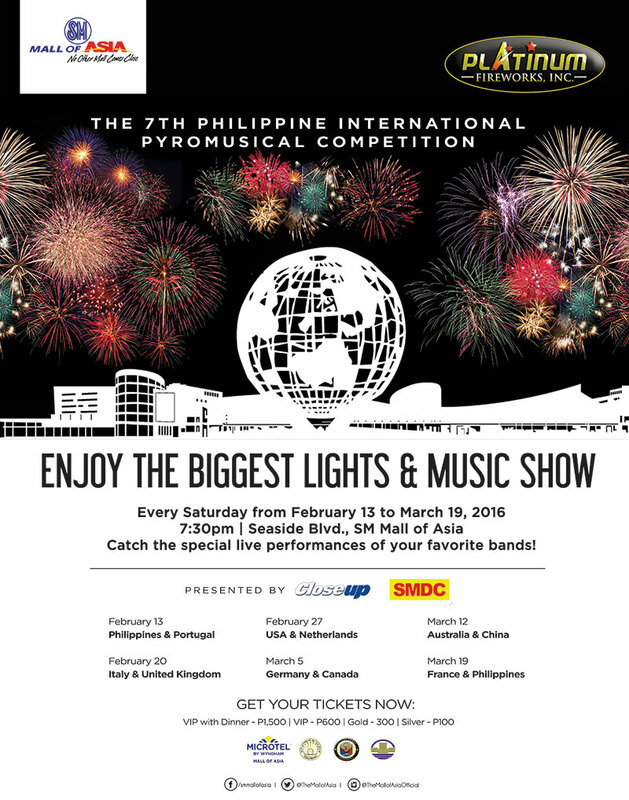 The 7th Philippine International Pyro-Musical Competition will happen every Saturday at the Seaside Boulevard, SM By The Bay, SM Mall of Asia complex, starting February 13, 7:30PM, and will run until March 19. The ticket prices range from P100 to P1,500 and are available at SM Mall of Asia and SM ticket outlets. The 7th Philippine International Pyro-Musical Competition is in partnership with Platinum Fireworks Inc., co-presented by Close Up and SMDC, with special thanks to the Department of Tourism, City of Pasay, Philippine Reclamation Authority, Microtel Mall of Asia, Magnum Manila, and Canon. Head on to pyrophilippines.com for tickets, schedules and other details.